Bees and other pollinators play a critical role in the lifecycle of millions of plants, including those we rely on for food—one of every three bites of food relies on cross-pollination by a bee, moth, fly, hummingbird or other pollinator. As homeowners using pesticides, or as licensed pesticide applicators, we all share responsibility for protecting pollinators from risks associated with pesticide use. There are steps that all of us can take, including reading more about pesticides and pollinators; following best management practices (BMPs); and always reading and following the label. As part of the EPA’s campaign to encourage pollinator health, they’ve added more pollinator-specific language to pesticide labels, so if you have products with old labels, check out a new version on-line. 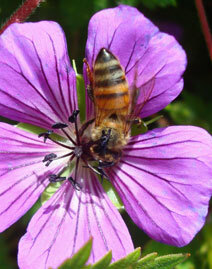 Other useful information on pollinator protection may be found below.